International Association of Teamwork Facilitators: Audio Interview: Dr. Laurence Martel, author of "The 7 Secrets of Learning Revealed"
Audio Interview: Dr. Laurence Martel, author of "The 7 Secrets of Learning Revealed"
One of my great joys is having the opportunity to meet and spend time with wonderful, brilliant, and generous people. This describes Dr. Laurence Martel who authored "The Seven Secrets Of Learning Revealed -- What Your Teacher Never Taught You, Because Your Teacher Never Knew". I met Dr. Martel at the Anthony Robbins Foundation "Discovery Camp" program in the summer of 2001. Our job was to train the 100 teachers enrolled in the program. We were brought back again to work with the teachers at Discovery Camp 2003. Through his organization, Dr. Martel helped thousands of educators learn how to teach more effectively and always with more fun. It was an honor to work with Dr. Martel on several school staff training projects. 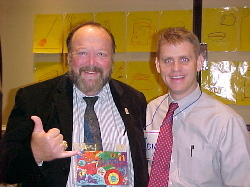 I am sad to report that Dr. Martel passed away on January 7, 2007 from heart complicatioins. I will miss his joyful spirit. I am happy to report that I had the great fortune of interviewing Dr. Martel about his book The Seven Secrets of Learning Revealed. In this interview Dr. Martel reveals his seven key concepts for creating a dynamic learning environment. CLICK HERE listen to this audio interview. You will be taken to a password protected "Members Only Area". Membership is free with your subscription to the free TeachMeTeamwork.com e-newsletter. Details about the Members Only Area HERE.